Luckily, today, restaurants seem more than willing to offer multiple choices, cooking styles, plate sizes, and substitutions. Almost every time, my meal is perfect for ME. It’s been a while since I’ve run into a situation where I didn’t have a choice when looking through a menu. If I did, you can bet your last penny that I wouldn’t go there! Would you? Now think about education the same way. If parents didn’t have choices on education opportunities for their children…well, it would be the same as trying to force a picky 8-year-old to eat tomatoes! Not desirable. Since this week is National School Choice Week, I started thinking about how lucky Florida students are to have so many choices in education. Last Friday, FLVS took part in the kick-off event to celebrate the week in Jacksonville. Seeing all of the students using different forms of school choice to complete their education was really quite a sight. It was inspiring to say the least! 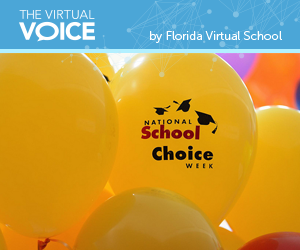 FLVS is a choice for students in Florida and it’s our goal to continue to serve students, no matter what education path they are on. FLVS has had more than 2 million successful semester completions since our inception. In the 2013-14 school year alone, FLVS successfully served 192,820 students taking FLVS Part Time in conjunction with their other methods of schooling, and 5,104 students taking FLVS Full Time as their primary school of enrollment. FLVS works with all school choice scholarship programs. We have students from the McKay Scholarship program, the Florida Tax Credit Scholarship program (commonly known by the primary organization administering the scholarship, Step Up for Students), and Personalized Learning Scholarship Account program taking FLVS courses. I have the pleasure of meeting parents and students all the time who are so thankful that they have the opportunity to take FLVS courses, in whichever way it fills the gaps in their education. So this week, and always, let’s be proud that Florida gives each of you choices to fulfill your educational goals and aspirations. This entry was posted in Educator Edition, Homeschool Edition, Parent Edition, Student Edition and tagged Educational Options, National School Choice Week, Scholarships, School Choice, School Choice Week, SCW on January 26, 2015 by Holly Sagues.